I'm not ready for it to be a new year already. I think we should adopt the Mayan tradition and celebrate the new year in July. Did you know the French used to celebrate it on March 25, until 1582, when they finally adopted the "reformed" calendar? That would be fine with me, I'd have another few months to slouch around. It is believed that the Babylonians were the first to make New Year's resolutions, and people all over the world have been breaking them ever since. The early Christians believed the first day of the new year should be spent reflecting on past mistakes and resolving to improve oneself in the new year. Lord. A friend of ours declined to join our New Year's gluttony and debauchery this evening. She's going to spend the night all by herself, reflecting, ruminating, revising and resolving. Criminy, what a waste of a good Saturday night. Ok, ok, I'll do a list. But this year I'm going to be realistic about it. I usually set impossible goals, try to climb ginormous mountains, and give up after a few weeks. Why set myself up for failure yet again? Now, there's a list I can live with. So, my friends and relations, here's a tip of the cup to you and yours. I wish you all the best of all possible futures, and the warmest possible memories, for "auld lang syne". Just for fun, a musical Christmas offering: Christmas Dinner (No, Not the Fruitcake!). My aunt is a children's choir director and songwriter extraordinaire. She wrote this song for one of her Christmas pageants a few years back, and it's always cracks me up. Warning, this song can get into your brain and refuse to go away. You'll find yourself singing it in the shower. 1) Mother makes a lovely Christmas dinner ev'ry year. Turkey, dressing, rolls and salad, ev'rything is here. Cookies, pies and special puddings I will eat it all. "No, not the fruitcake!" "No, not the fruitcake!" "No, not the fruitcake!" "No, not the fruitcake evermore!" 2) I don't mean to be ungrateful, mother works so hard. Yet this fruit cake looks like something found out in our yard. Oily, brown - all squishy, flat and round. It's really awfully vile! Sick of Christmas stuff yet? Tuff. I've got a few more Christmas recipes to share, and today being Chocolate Friday, is all about the sweet brown ones. First, from our friend the KeeWee: Afghan Biscuits, a "deceptively decadent chocolate biscuit ideal with coffee, after dinner or as a small treat". Next, the traditional Christmas cake in France is a log: Chocolate Logs. This recipe is like an extended cookie sandwich. It says to use "sweet biscuits" (that's a cookie for us 'mericans), but it doesn't say what kind, so I suggest using the most chocolately cookies you can find. Go Choco! An easy Christmas recipe for kids from Nestle: Chocolate Christmas Tree. From Italy: Christmas Chocolate Bread. This recipe actually sounds a lot like fruitcake, with a chocolate twist. Which reminds me, I'm going to post a funny little song my aunt wrote, and her church kids recorded, about fruitcake. If we can get it converted to mp3. Ok, last recipe is from the Olympic Chocolate Festival website: Crazy Chocolate Cake, made with no eggs or butter. I was surprised to find out there's a Chocolate Festival held in Sequim (that's pronounced skwim), WA every year. Another good reason to visit my home state. I'm marking the date for the next one - April 22, 2006. Thanks to Cynthia for letting me know about this! Roll out dough on a lightly floured surface to about 1/4 inch thickness. (If you're making shapes, press the cookie cutters down into the dough and transfer cookies to cookie sheet.) For my almond cookies, I cut the dough into 2 - 2 1/2 inch squares. Transfer squares to cookie sheet. Spoon a small amount of the almond paste / filling into the center of each cookie. Sprinkle the chocolate sprinkles over the top. Fold up the corners just a smidgy, they don't have to close over the center. Bake at 350° for 12-18 minutes, or until the edges just begin to turn brown. Whew, now that my frenzied rush to get the house ready for company has subsided, I can take a minute to look around me and see what's the holiday haps in the blogosphere. I've been enjoying Kat's Christmas music postings. She promises just Christmas music from now until Christmas Day. I'll bet there's something there you've never heard in this eclectic collection. Go have a listen. Speaking of music... here's a bump to the Coffee Hymn, recorded by my aunt and myself, written/arranged by D, of Third World County. It has nothing to do with the season, just a cute worshipful tune for those of us who love the holy bean. Cindy of Cup of Tea & a Blog is still lost, traveling in parts unknown. We miss you Cindy! Come home safe! Fortune of BCCY is traveling too, doing the Tassie circuit. I can't say I'd like to be traveling in Tasmania at Christmas-time, but ... each to their own. Chuck of Cafe Metaphoric must be as busy as I've been these last few weeks. But I see he likes my Christmas Coffee recipe. Thanks Chuck! And he's got a good list of Coffee Lover Gift ideas for those of you who still need last minute gifts. Vancouver Coffee is in the spirit with a recipe for Mulled Cider, and more Christmas flavorings with the peppermint post. Here's another one from Tea Posur, who is now 24 (oh, to be 24 again!) - Earl Grey Cocoa. Sounds interesting. I'll have to try it. 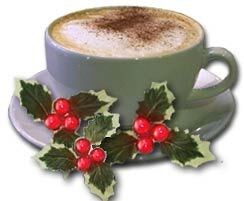 Over at Bloggle you'll find the Best of 2005 Coffee Brewers (wonderful way to wrap up the year), and Cadmus' own Holiday Blend. Hey Doug, put me on your Christmas list, I want some! Audrey of Coffee Sage is back and posting, with her recipe for Swiss (chocolate) Coffee (YUM! ), and a Visit from the Coffee Santa. Steph's Cup of Tea has some great holiday posts. Start here: Holiday Tea Table. I just love a beautifully set table! Well, that's all the blogsurfing I can do this morning. I'm going to make Christmas cookies today. Every year my mom and I used get together and spend an entire day cooking and baking. We'd have coffee and make batches of CCCCCC for gifts (and eating) and sugar cookies for the gift baskets (and eating). I'm hoping her spirit will join me this morning as I bake. I've modified our sugar cookie recipe a bit, I hope she won't mind. The big question, the really big question, is ... shall I have cookies for breakfast? Think those coffee pots with timers are new and inventive? Check this article, showing there truly is nothing new under the sun. To the woman who thinks my Jingle Ball humor is sophomoric: Sophomoric vs. The Giggle Monster, or How I Found My Christmas Spirit. Hadta laugh, speaking of sophomoric humor, when I stumbled across this blog: Darjeeling in the Teapot. Is it just me or does that image look like a diaphragm? I was hoping for more teastuff here but couldn't find any. Coupla items I want to mention before I get abducted by aliens again... or maybe those little creatures were really Santa's elves eh? Hmmmm. ANYway, firstly, the Carnival of the Recipes #69 is up at Dubious Wonder. Great holiday themage here, go check out all the great recipes! Holiday Tea Break - You don't need to sell me on the benefits of tea time. Scroll down for the creme of this post, a truly delish sounding recipe for EGGNOG SPICE POUND CAKE! Oh yeah, now that's a good addition to any tea break. Gifts for the Tea Lover - Hmmm, not a bad list here. A bit scant, but there are some items I might add to my Xmas list. Like the Tea for One teaset here, now isn't that pretty? Just right for an old broad like me sipping tea alone on a wintry afternoon. And now, something for the coffee lover, another interesting way to make coffee while you travel: The Press-Bot, a coffee press that fits inside of the standard bottle everyone carries with them when they travel, camp, etc. I don't know about the "standard" part, from the looks of it, I might have a bottle that would fit. I'd like to try one out to see. Actually, this looks really familiar. Have I blogged on this before? Did the elves mess with my memory? Heh. I'd rather blame it on elves than early Alzheimer's. My brother's contribution to the Annual Christmas Sugar Overload is this delicious peanut butter and chocolate candy-ish thing he calls Jingle Balls. It seemed appropriate to share it here for this week's Chocolate Friday, with his permission of course. After all, they're HIS balls. This is a single recipe, which makes about 12 medium (1 1/2 inch) balls, or 24 small (1 inch) balls, but he usually triples the recipe. Mix together until creamy, and then refrigerate for a few hours (you can't work with soft dough, Bro says, you just get mushy balls... and he HATES having mushy balls). 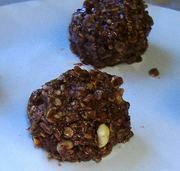 Melt 12 ounces semi-sweet chocolate chips with 2 tbsp parawax (edible paraffin). Set onto wax paper on a cookie sheet, and refrigerate until chocolate hardens. Once hardened, you can stack them and pack them, and abuse them in a variety of ways. Bro puts them on a pile on a small paper plate, or stacks them tall a small bowl, covers with plastic wrap, and ties a ribbon round. He calls this a bundle of balls. There you go. Jingle Balls. Very chocolately. Delish. As soon as he makes them this year, I'll add photos. Or maybe I'll just try to make up a batch my own self. They don't actually jingle. But you probably already figured that out. Ok, so I've missed several Carnivals, and a coupla Chocolate Fridays, but boy, my house sure looks nice and Christmassy. I finished almost all my shopping and I've got the menu almost all planned. Heh. Now all I have to do is sit back and wait for the guests to arrive. This afternoon I'm experimenting with Christmas coffee flavors to serve said guests upon said arrival. Well, and for myself, of course. Heh. I bought some of that peppermint flavored creamer to try. Didn't care for it. I tried an eggnog latte at my favorite coffee shop - loved that. LOVED it. I was hoping to find some eggnog flavored non-dairy creamer - for that touch of lactose intolerance that age created - but had no luck. So I just bought a small carton of eggnog, and that's good for a splash. I'll keep the peppermint and offer both to my guests at Christmas. Allow to brew for 5 minutes, stirring gently midway through. Remove nuts and cinnamon stick and press. Add 1/2 stick cinnamon to cup, and pour in coffee. Add a dollop of whipped cream if desired. Sprinkle ground cinnamon on top. If you're going to use a drip coffee maker, add the cloves, cinnamon and nutmegs to the basket with the coffee grounds. After the coffee is made, remove them, rinse, and add to the carafe so the flavor can continue to be released. I used a good strong coffee for this, as the cloves add a strong flavor. You need a rich coffee to stand up to the spices. I tried a french roast, and an espresso, and I liked the french roast best. The whole nutmegs added a very light flavor, maybe they need to be cut in half for a stronger flavor, but I preferred it not be overwhelming.